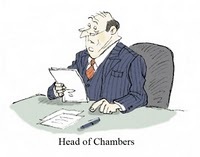 ‘I assume that you don’t intend to go to court like that BabyBarista?’ It was HeadofChambers. ‘It avoids the need for cufflinks,’ I replied. ‘And as for your slip on shoes and off the peg suit…’ He was at this point literally lost for words.